In writing this column for the last four years, it has been a challenge to write something that would be of interest to the membership. Writing is not my forte. Most of the time there have been life events that prompt a theme which can in some way conclude with encouragement for member participation in the society. In looking back, I find I have written about farming, baseball, weather, genealogy, sheepshead, language, reunions, and a few other things. As I now write what I anticipate to be my final President’s Message, I am unable to identify that theme on which the column will be based. So I will just ramble on a bit with some of my thoughts. I joined the society shortly before my retirement and was invited to join the board in 2002, the year of my retirement. After 40 years of service with the company, becoming a member of the society provided a way to remain in contact with many of the people with whom I had spent a good portion of my life. The friendships made are greatly cherished. I felt honored to become a member of the board and to continue to work with a few people I knew well and a few others whom I did not know as well. It has been an additional honor to serve as your president for the past four years. My thanks to all who have served on the board during that time. Your contributions to the functioning of the society are greatly appreciated. Now I feel it is time for me to move on. There are other areas in which I wish to focus my time, primarily associated with family and church. The society is 25 years old this year. Until this past year, its role has been to publish a quarterly newsletter for its members, provide a quarterly luncheon in the Milwaukee area, and provide a biennial reunion in Milwaukee. It has been funded by member dues along with subsidy from the company for newsletter publishing and mailing and a portion of the reunion expenses. Recognizing the need for better communication among retirees and the prevalence of social media in most of our lives, the company provided resources to help the society establish WSJSociety.com. 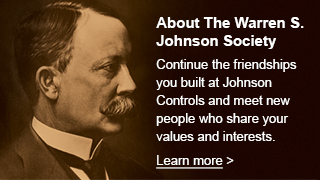 The site not only provides a means of connecting with other members, there is a wealth of information about JCI (its history as well as current events), photos, retirement resources, member benefits, the calendar of society events, and much more. The site is just over a year old and much has been added. As more members participate, we can expect to see even greater things. I’m “movin’ on”, but I’m not “movin’ out”. Through WSJSociety.com and the regular society events, I’ll still be with you. Thanks for giving me the opportunity to serve. Let’s keep in touch!